Dressfor Success Atlanta is a not-for-profit organization that offers services to help women enter the workforce, stay employed, advance in their careers and improve their lives by providing professional attire, a network of support and career development tools. . It was founded as Working Wardrobe in 1997 and affiliated with Dress for Success Worldwide in 1999. 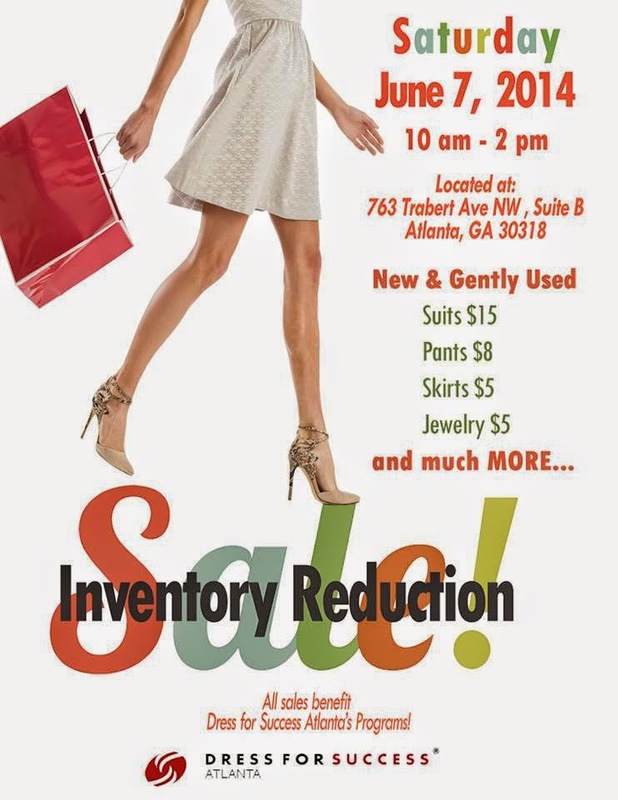 On June 7th Dress For Atlanta has a HUGE Inventory Reduction Sale for the public. Come one, come all... amazing clothes at amazing prices. Don’t miss out on great deals! New and gently used items available at better than thrift prices. All proceeds fund Dress for Success Atlanta programs so we may deliver workforce development programs to over 1200 women in 2014. Plenty of FREE parking! In 2008, Dress for Success Atlanta helped more than 1,700 women take their first steps to success and offered continuing support to them as they made the transitions into their new lives. And, they celebrated a milestone - Dress for Success have suited our 10,000th client since our founding in 1997.